Diego, and his twin brother Jose Carlos Maria, were born in Guanajuato, Mexico, on December 8, 1886. His parents, Maria and Diego Rivera, were delighted by the birth of their twins. However, their excitement would be soon contained when Jose died after only 18 months. Maria and Diego were now fearful that the same fate would strike little Diego. Out of fear for his life, they placed little Diego in the care of an Indian nurse named Antonia. 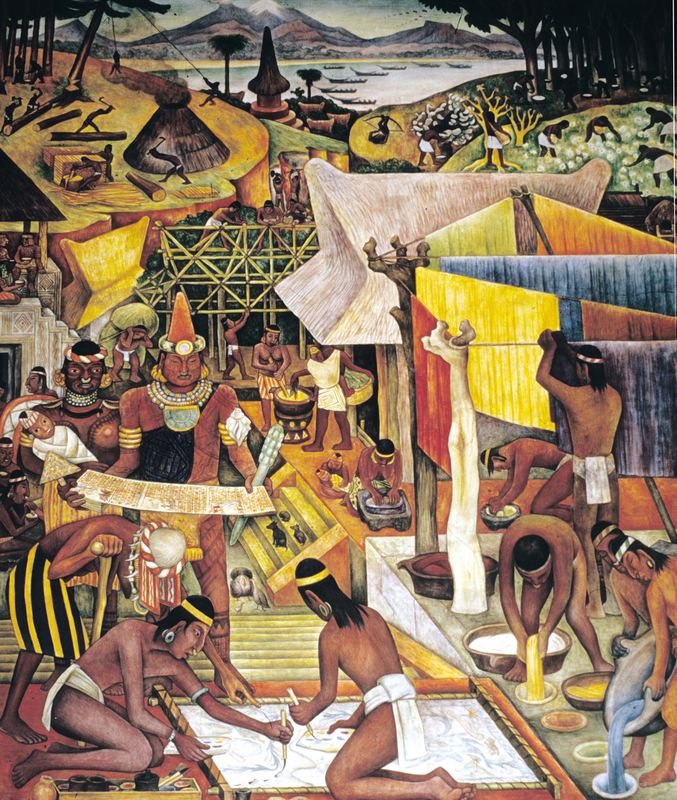 Both of Diego Rivera's parents were teachers, and little Diego excelled in school. His artistic talents were recognized by the age of ten. At this time he began taking classes at the Academia de San Carlos, which was Mexico's most important art school. Then in 1906, he was awarded a scholarship to study art in Europe. In Brussels, Belgium he met his first wife, Russian painter Angelina Beloff. Diego soon married her, and they spent the next ten years studying art in Paris, France. Diego and Angelina lived the entire time on very little money. During this period in Paris, Pablo Picasso would become one of his biggest supporters. In 1921, he left behind his wife and two children, and returned to Mexico. As soon as he returned he began painting murals for the Mexican government. Then, in 1922 Rivera joined the Mexican Communist Party. That year, Rivera also began work on a mural in the three story Ministry of Education building. At this time he was very close to the great Mexican painter David Alfara Siqueiros. Then in 1927, Diego moved to Berlin, Germany. In Germany, he attended at least one of Hitlers rallies. He would spend ten months in Moscow where he listened to Joseph Stalin speak. On August 21, 1929, he married Frida Kahlo. Frida was beautiful, and much younger. Her parents were not very happy, and they describe their wedding ceremony as a marriage between an elephant and a dove. Diego and Frida now made their home in Mexico City, and over the next few years they would each have numerous affairs. In 1930, Rivera was commissioned to paint his famous mural on the walls of the National Palace. It would take him until 1951 to complete this mural. Later, in November of 1930, he and Frida would leave for the San Francisco where he would paint murals at the Pacific Stock Exchange and the California School of Fine Arts. Next, Diego would have a one man show at the New York Museum of Modern Art. Nearly, 60,000 people visited the exhibition. In October, 1932 Rivera was commissioned to paint a mural at the Rockefeller Center, New York. He immediately came under attack because he wanted to paint a Communist theme featuring Lenin. The mural was eventually destroyed when Nelson Rockefeller sided against Diego. Then in 1939, they were both having numerous affairs and they divorced. Frida Kahlo moved back into her Blue House in Coyoacan, a suburb of Mexico City, and before long she was producing some of her best work ever. The home was the same one that she had been raised in. Diego Rivera would again remarry on July 29, 1955. This time to publisher Emma Hurtado. However, the marriage would be short lived, as Diego would die of a heart attack on November 24, 1957.